Apple Music’s paying subscriber base has surpassed 36m worldwide – a figure which remains about half the size of Spotify’s equivalent premium audience. The news means that Apple has slightly increased its average month-on-month net subscriber additions over the past quarter. The last semi-official announcement from Apple Music arrived when Jimmy Iovine confirmed the service had topped 30m subscribers at the end of September last year. Today’s update, care of the Wall Street Journal, means that platform has since added 6m subs in under five months – just over 1.2m every four weeks. That still lags slightly behind Spotify’s recent average. Daniel Ek’s company announced it had reached 70m paying subscribers last month. That meant that it had added an average of 2m subscriber per month across an unbroken 10 month period. However, according to the WSJ, it’s a different story in the US – where Apple is set to overtake Spotify’s total subscriber base this summer. ‘Apple’s subscriber-account base in the U.S. has been growing about 5% monthly, versus Spotify’s 2% clip,’ reports the newspaper. This is all good news for artists and record labels, of course – but, then again, perhaps not as good as they might argue it could be. 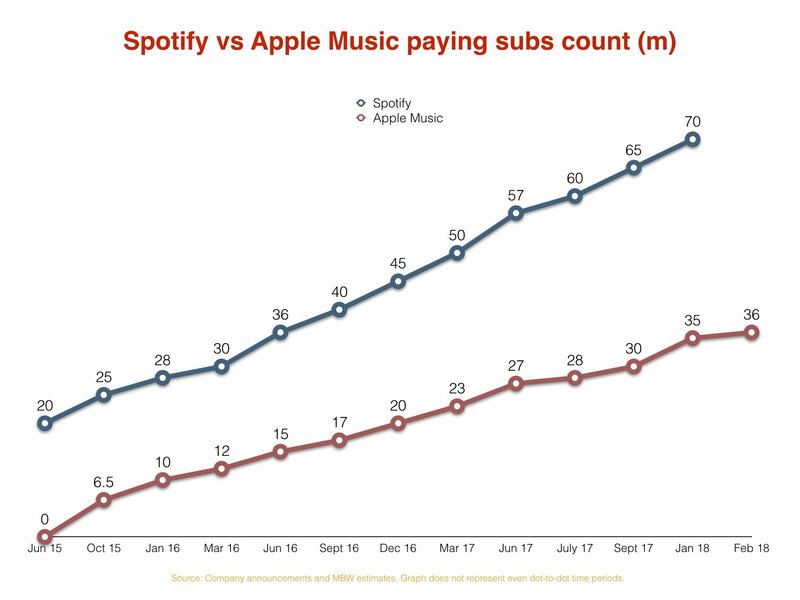 If every subscriber in Apple and Spotify’s most up-to-date combined subs base (106m) were shelling out the US ‘standard’ $9.99-per-month price, the two services combined would be turning over a whopping $12.7bn across a 12 month period. Sadly for rights-holders, it doesn’t work that way. Not only do territorial differences greatly affect prices, but Apple and Spotify have recently both used discounted packages such as student and family prices to lure customers in the quest to quickly ramp up their subscriber bases. Because of discounts like these, MBW discovered last summer that the average global Spotify subscriber in 2016 was paying around $5 per month – half the ‘standard’ $9.99-per-month cost many people reference when referring to subscription on-demand streaming. 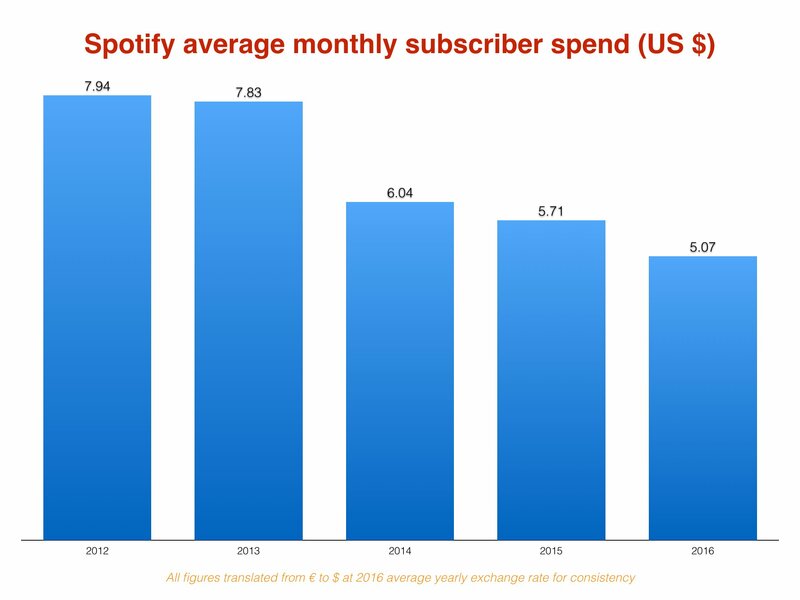 That equated to an average annual spend from 2016 Spotify subscribers of just $61 – some $30 cheaper than the equivalent average Spotify subscriber was paying as recently as 2013.